good luck with your project! and have fun on your Purim celebration... sounds like fun! Beautiful post, Keshet. Good luck with your gift baskets! Great post! Those chicks are cuuute! GL getting it done! P.S. That video is awesome! Very interesting! Those chicks really are cute! Love your post Keshet - and that last paragraph brougth a tear to my eye. I hope you have a great time and your preparations go as planned - please post pics of your barnyard creations!! Now I know something new today! And I love the video they put together!! Good luck with the pops and can't wait to see how they turn out-so cute! I love learning about different cultures especially their religious customs. you'll totally do an awesome job! and everything will be fantastic---and if you don't get around to do everything you planned, it'll totally be okay because you'll still have a wonderful time with your loved ones! those chickies are adorable and thanks for explaining customs. I love the story of Esther! And thank you for the Purim explanation - I had a vague general idea, but very cool to learn more about it. Thanks so much for sharing this Keshet. I learned something new today, I know the story of Esther but didn't know about Purim. Those chicks are adorable! Can't wait to see how your baskets turrned out! Thanks for the Purmim background!!! Thanks for sharing! It's something I really don't know anything about so it is always fun to learn new things :) Your gift baskets sound fun! Happy Purim! I've always wanted to try cake pops so share pictures if you get a chance! 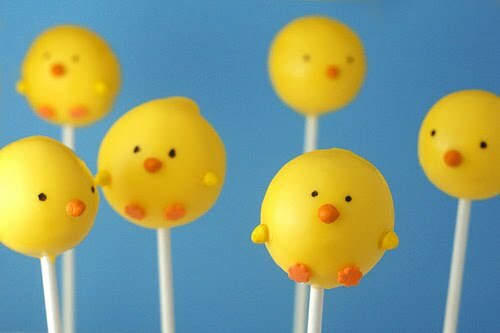 Those little chick pops are ADORABLE!! Thanks for the lesson! Always fun to learn about other cultures/religions. I love hearing about these festivities. What kind of costumes do you dress in? I'm curious!! What did you end up making?